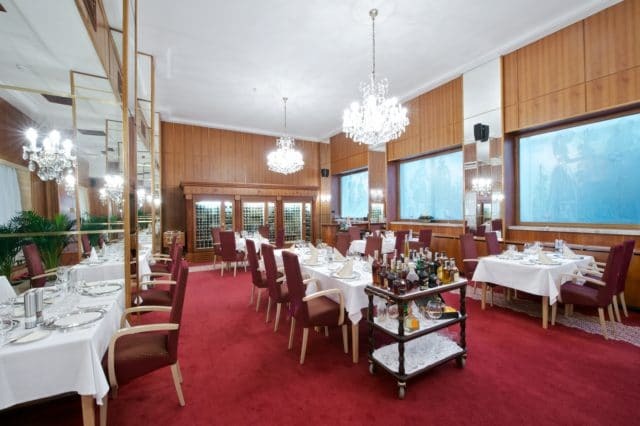 This hotel overlooking the Danube River is 1.1 km from Bratislava Castle and 1.3 km from the Slovak National Theatre and it offers an exquisite Culinary treatment. The French Restaurant at Hotel Devin is a combination of traditional culinary specialties and scrumptious, modern flavors. The atmosphere of this charming French Restaurant, that was recently distinguished by the prestigious French food guide Gault Millau for its premium quality of food and French-style service, is historical and classy. The restaurant is also regularly rated as one of the best restaurants in Bratislava in the Trend Top Hotels and Restaurants yearbook. Executive Chef Miroslav Milučky creates exceptional culinary experience be it with traditional Slovak dishes with modern accents and flavors, or exquisite international delicacies, all prepared from high-quality and fresh ingredients. The exquisite food offer is served with premium cognac, rum or delicate wine. The premises in the city centre with daylight, a professional sound system and state-of-the-art presentation equipment are a good option for your meetings. Conferences, seminars or business meetings will be a real joy with no worries thanks to the excellent management and services.